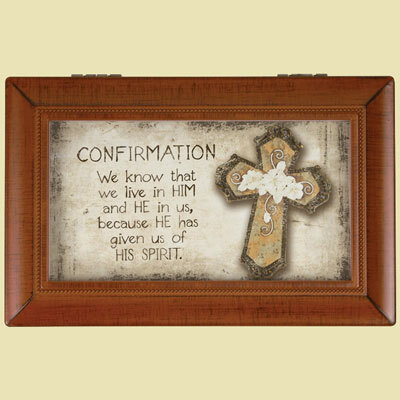 Navigate: StoreFront / Christian Home Decor / Christian Home Accessories / Confirmation Music Box Plays "Fur Elise"
Share this product and receive a $1.03 sharing discount. This Carson Home Accents music box has been manufactured to the highest quality standards available. Each music box features a high quality hand crank mechanism. The interior is lined with velvet. Music box gift plays the tune Fur Elise when the lid is lifted. Wood grain box measures 6" x 4" x 2.5". Confirmation: We know that we live in Him and He lives in us because He has given us His Spirit. Cross motif, suitable for young men and young women. 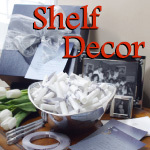 Keepsake box for jewelry, photos, and things to save. Once you receive your music box you may customize it with a photo in the lid; sturdy hinged lid with brass-tone hinges.